Omaha, USA, July 22, 2015 - 25-year-old outside hitter Kimberly Hill is a key player for the United States team. Last year, she led USA to a historic first World Championship title as the competition's MVP. She is hoping for another victory this week, when the FIVB World Grand Prix Finals take place in her country for the first time. In an exclusive interview with the FIVB, Hill talks about the tournament, her goals for the future and her love of the sport. How satisfied are you with the performance of the US team in the preliminary round of the FIVB World Grand Prix and with your own contribution? Kimberly Hill: So far I think we’re playing well, but we can definitely play better. We still have things to improve and hopefully during Finals week we will keep getting better at them. How important is the World Grand Prix for the US team this year? Hill: It’s always a big tournament and very important. This year it’s especially important as we prepare for the World Cup. Is the home advantage in the Finals an extra kick for you and the team, or even more pressure? Hill: We don’t really see it as pressure - we see it as just a really great opportunity to play in front of a home crowd and have a lot of fun! How do you rate your team's chances of winning the title? Hill: We definitely have a really good chance, as long as we play the good volleyball we know how to play. Your coach Karch Kiraly won a lot of titles in his career as a player. How important is his input for the US team? Hill: Obviously Karch is a great coach and has trained us really well. So now hopefully the work we’ve put in will show during this tournament. Which teams are the favourites for the final round? Hill: All of the Finals teams are solid teams, anyone can win if they’re playing well. What are the main goals for you and the national team this and next year? Hill: For now, the most important thing is to qualify for the Olympics by doing well at the World Cup, and then we’ll take things from there! Are the Olympics already the big topic in the team? Your main goal for 2016? Hill: For now, we are focusing on doing well at the World Cup and of course at the World Grand Prix. But the Olympics are always on our mind! Looking back one year, what was it like winning the FIVB Volleyball World Championships and receiving the MVP award? Was it your biggest volleyball moment yet? 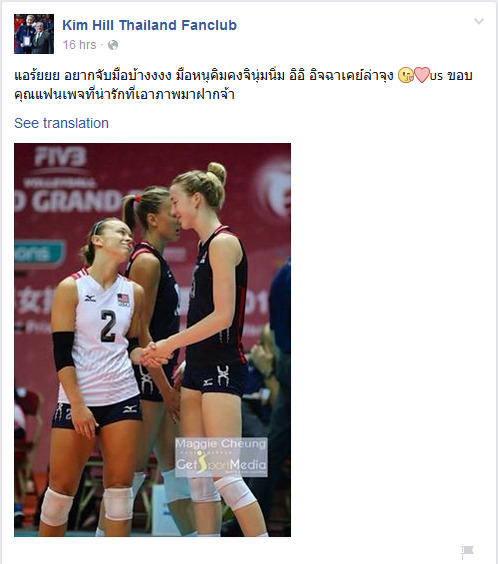 Hill: Winning the World Championship was for sure the biggest moment in my volleyball career. The feeling was really indescribable. And I’m hoping that USA volleyball can win more big titles like that in the next few years and beyond. How do you rate the importance of the FIVB World Grand Prix? Hill: The World Grand Prix is always a great competition and very important in our preparation for the World Cup. There are many good teams here which will test us and help us to get better, so that we can see what we need to get better at. Why did you choose volleyball as your sport? Hill: I love the passion and emotion of volleyball, and I love that it is a sport where the team aspect is so important.